The award-winning author chats with SLJ about her latest work, an SLJ star and popular pick. 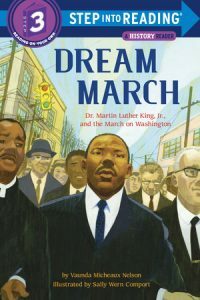 How were you able to incorporate so many rich historical details about the March on Washington in a “Step into Reading” book? This wasn’t my first time writing in the early reader format. I did Ready? Set. Raymond! for Random House and Juneteenth with my husband, Drew, for Lerner. Still, there was much to learn and relearn in the process, and I was thrilled to return to this format. Writing in the early reader format is much like writing a picture book. Every word, every beat, counts in creating a work that is concise, poetic, playful, engaging, deep. But early reader books pose their own unique challenges. There are strict rules and guidelines for each level. Every line, every word, even every character has to be carefully chosen. A word I might choose for a picture book to express a concept might have to be replaced with one that is shorter (to meet the characters per line requirements) or simpler (to meet the level of vocabulary complexity guidelines). There’s an excitement in this exercise—identifying just the right word. When you do, there’s that eureka moment all creators live for. The use of clauses and other more complex constructions is limited as well. My editor called some of my early sentence constructions “tricky,” too tricky for the reading level. Probably the hardest challenge for me was finding ways to express intangible concepts, such as human rights, truth, or freedom. In an early reader, the text must express ideas that can be clearly illustrated in order to provide novice readers with visual clues. More than a few times my editors would write comments such as, “Beautifully put, but difficult to illustrate.” We worked together to try to do justice to Dr. King and this moment in our history. I wanted to leave readers with more than information and reading practice. I hope Dream March makes them think…and feel. Was there a piece of information that you had to omit but wish you could have kept? Absolutely. And not just one. There was so much wonderful material about the journeys made to Washington, DC—the number of buses and trains and how people who could not go waved from curbs and porches as lucky travelers passed by. My early drafts included more description of the people who marched, the songs they sang, and the spirit of the day. I also had included a section about basic human rights and peaceful protest. So much had to be cut or tightened. But this is part of the process in all formats. There are always favorite words, sentences, and scenes that end up being sacrificed. You dedicated this book to Carla Hayden, the 14th U.S. librarian of congress. I could not think of a more fitting tribute! Can you talk a bit about that decision? I first came to know Carla and her lovely mom, Colleen, back in the late 1980s, when I was in the MLS program at the University of Pittsburgh. She was smart and inspiring. I was a student in her computer/technology resources class. Later she left for a position at Chicago Public Library, then to Enoch Pratt Free Library in Baltimore. We didn’t keep in close touch, but I tried to stay up-to-date on her accomplishments. Occasionally, our paths crossed at ALA conferences. I am over the moon about her appointment. 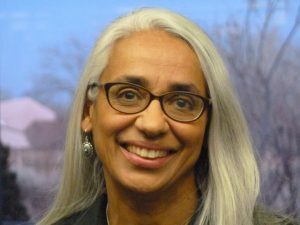 We’ve all moved forward because of Carla, and I am truly grateful.